The fact that XXL design and a feminine look are by no means mutually exclusive is proven by the TW Steel watches for women: glittering glass crystal trim, precious stainless steel bracelets, for example in the colour rose gold, or glamorous pink calfskin straps underline your femininity. In addition, the steel timepieces are easy to read and robust, and made of high-quality materials in accordance with Swiss quality standards. You will be thrilled when you choose a TW Steel watch. The prices at Timeshop24 will also please you: We offer TW Steel watches especially cheap! Free shipping within Germany and various Payment methods, including the secure and convenient purchase on account, are part of the service of our online watch shop. So that you have long joy at your clock, we offer maintenance and if necessary repairs in our in-house service workshop. 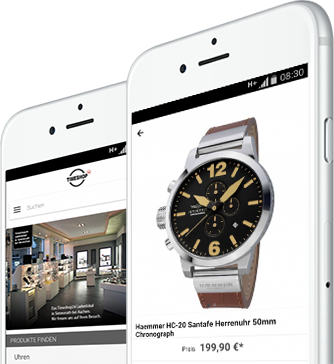 Install the Timeshop24 Shopping App an stay informed about the latest trends and styles of your favorite watch brand. Have a good time discovering our products. Best-beloved products can be saved on your personal wishlist or shared with friends. Order watches and jewelry when you want and where you want. Receive Push-Notifications with special offers for App users only.